PPR is not currently required for access into the Channel Island Airspace. This news display is for information purposes only, please ensure you check the latest NOTAMs for Operational Information. Welcome to the Channel Island Airspace VFR Flight Planning Guide and Online PPR Reservation System. This guide has been put together in order to provide a readily available resource of simple plain text briefing material for the assistance of pilots wishing to operate in the Channel Island CTR and associated CTAs. They are provided for guidance purposes only. The author has produced these purely for the assistance of other pilots and cannot guarantee or provide assurances as to continued accuracy, reliability of data or any omissions contained herein. It remains the responsibility of the pilot in command to carry out comprehensive pre-flight planning based on current data from approved sources, including NOTAMs, UK and French Air Pilots. So you are planning a trip to Jersey, Guernsey or Alderney and as such will require access into Channel Island Airspace. The chances are you may have looked at your chart and promptly come to the conclusion that it may be a little more complex than the flying you normally undertake. Not only will you be navigating over large stretches of open water but you will also need to talk to someone! Well, with a little bit of careful planning, some help, guidance and support from this web site, you will soon be in possession of all the information you require in order to undertake your flight in a professional and proficient manner. a. Check and if necessary make a Channel Island PPR Reservation - This can be accomplished through this web site. b. Check NOTAMs and Air Pilot information for your destination airfield and comply with any additional permissions or procedures which may be required. c.	Brief yourself on basic entry and exit procedures, standard routes and visual reference points. e.	Check the Weather before departure to ensure the forecast meets your minimum requirements for flight in the class of airspace you plan to fly in. On 17th August 2017 Channel Island Airspace adopted the Standardised European Rules of the Air with NO derrogations. VFR and SVFR minima in the Channel Island CTR are aligned with the rest of Europe. Please see the VFR and downloads page for more specific guidance information. Regulatory information relating to the changes can be found in the latest version of the Director of Civil Aviation's "Aviation Journal" which can be downloaded from www.cidca.aero. 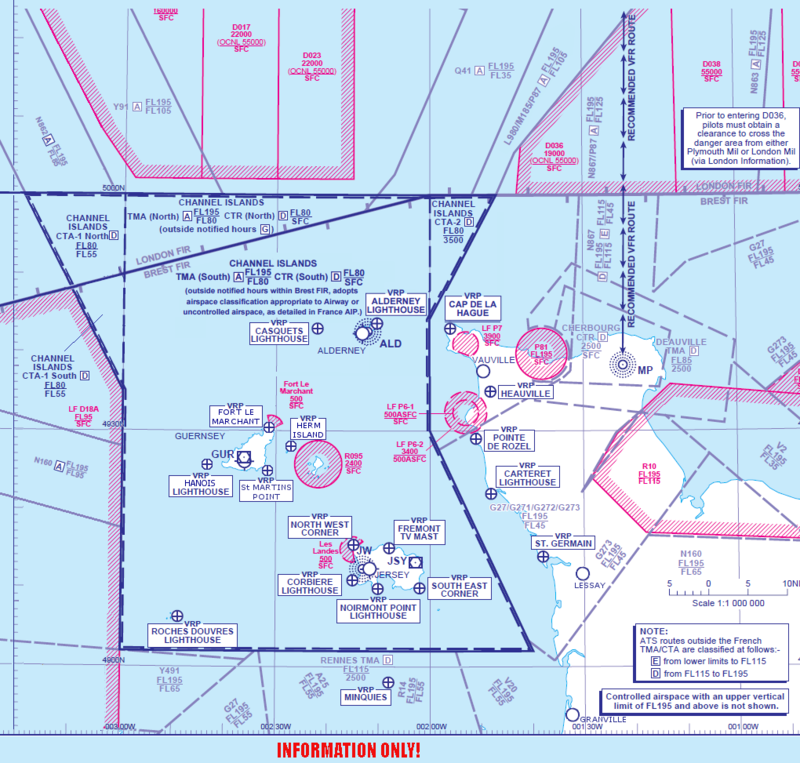 Channel Islands Airspace - Re-classified! 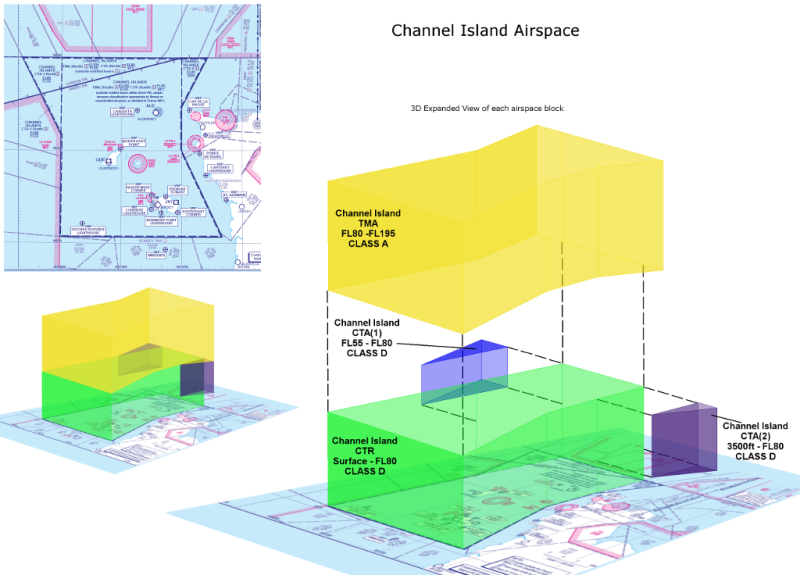 On 6th March 2014 Channel Islands Airspace went through a major re-classification process. Basically, the lateral boundaries of the airspace remain untouched, airspace from the surface up to FL80 was reclassified as class D and identified as the Channel Islands CTR (Channel Island Control Zone). The lower levels of the Control Areas CTA(1) and CTA(2) from their respective base levels up to FL80 were also reclassified as Class D Airspace. From FL80 up to FL195 has been established as a Terminal Control Area (TMA) and will remain Class A Airspace. The old CTRs around each of the Islands have been deestablished. The Channel Island TMA (Class A), CTR and CTA (Class D) been designed to protect the terminal approach and departure routes of Commercial Air Transport flights operating to and from each of the islands. Jersey Air Traffic Control is the controlling Authority for the majority of Channel Island Airspace. The pages available on this web site outline the basic of what clearances to expect, weather minima, your 'in flight' responsibilities, Air Traffic Control procedures, flight planning along with procedures for obtaining PPR for inbound flights if required.